Our Book | Alan L. Billian, P.A. Over the many years of working on divorce, custody and other family law cases, we have come up with our own approach to a stress-free resolution. 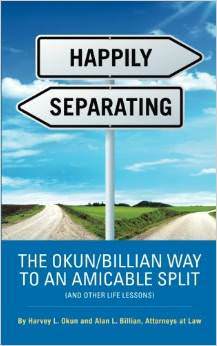 We use it with our clients all the time, but in 2014 we poured our knowledge into this book that we called Happily Separating. We did this so that separating couples (married or unmarried) all over the world could follow our proven methods and make smarter decisions during divorce and child custody mediation or litigation. You can purchase it in either digital or paperback format through Amazon or Barnes & Noble. Or if you would like a signed copy, feel free to contact us directly.